How do I customize the Boutiques plugin? The Boutiques plugin has several customization options, depending on the layout you choose, and even which features you do and don’t populate. 1. Once the plugin is installed and activated, create a new page by going to Pages → Add New. Name the page Shop, or something similar. If you already have created a Shop page, you can remove its contents and proceed with the instructions below. 3. Depending on the layout you have chosen, begin filling in the fields as prompted. In the section below these steps, we’ve broken down what each field corresponds to. 4. With your Shop content completed, hit publish. Your Shop is now live! Simply add it to the menu location of your choice (usually Primary or Top, depending on your theme), and your readers can now access it. This section feeds in your selected rewardStyle Boutique widgets, or ShopStyle widgets, inclusive of Instagram enabled widgets. For each widget, create a “tab,” or corresponding menu for that widget. This allows users to browse multiple boutiques within a single Shop page. You can create up to five different boutiques within our Boutiques plugin. Section Title → For the small title above the your Boutiques menu. Examples might be “Shop By” or “Shop My Faves.” During seasonal sales or the holidays, you can even opt for specific titles such as “#NSale Favorites” or “Holiday Picks,” with each Boutique Tab Title corresponding to a different boutique related to the overall theme. Tab Title → Refers to the menu labels/tabs for each boutique widget. Some example boutique tabs might be “Beauty,” “Accessories,” “Dresses,” or “Home.” Some bloggers get even more creative with boutique tab labels, and create boutiques that are focused around a product type (e.g. “Black Dresses Under $75,” or “Brass Accessories for Home”). Widget Code → Refers to the corresponding rewardStyle or ShopStyle widget codes output by either platform. This is the code you copy/paste from each affiliate platform after you have built the widget to your liking. In rewardStyle, you can build a boutique widget by going to Apps → Boutique, and in ShopStyle, by going to Create → Product Widget. You may also use these fields to embed LiketoKnow.it widget code, or ShopStyle Collection code (an accompanying Tab Title to these might be “Instashop”). This is an optional section which allows you to feature links to your favorite retailers. In the Featured Retailers template layout, the link list is featured above your Boutique Tabs, in a 4-column design set on a grey background. In the Featured Instashop layout, the retailer link list is shown as a 1-column list to the left of the Boutique Tabs, beneath the shoppable Instagram feed (see example on previous page). Retailer Links → In this box you can input all of your favorite retailers. Simply type in a shop name (e.g. “Nordstrom”) and highlight and link the text with the link (affiliate or otherwise) of your choice. Hit return, then type in another retailer name and repeat. The links will automatically format based on the Page Template layout you have selected! This is an optional section that allows you to feed in a rewardStyle LiketoKnow.it widget feed, or a ShopStyle Collection feed. It is only available if you select Featured Instashop as your Page Attribute template. Widget Code → Enter the LiketoKnow.it or ShopStyle Collection widget code, based off the widget you have built in either platform. Follow Button Text → If you’d like to encourage readers to follow your Instagram account, input a call to action here. An example of a call to action would be “Follow me @empressthemes.” You could also use this button to push users to your LiketoKnow.it page, if you are active on that platform. Follow Button Link → Enter the URL that corresponds to the button text you entered, above. Widget Sizing: When creating boutique widgets for the Featured Retailers template in the Brevier and Miramar themes, we recommend a max widget width of 900px. For the Featured Instashop template, size your boutique widget at 680px. 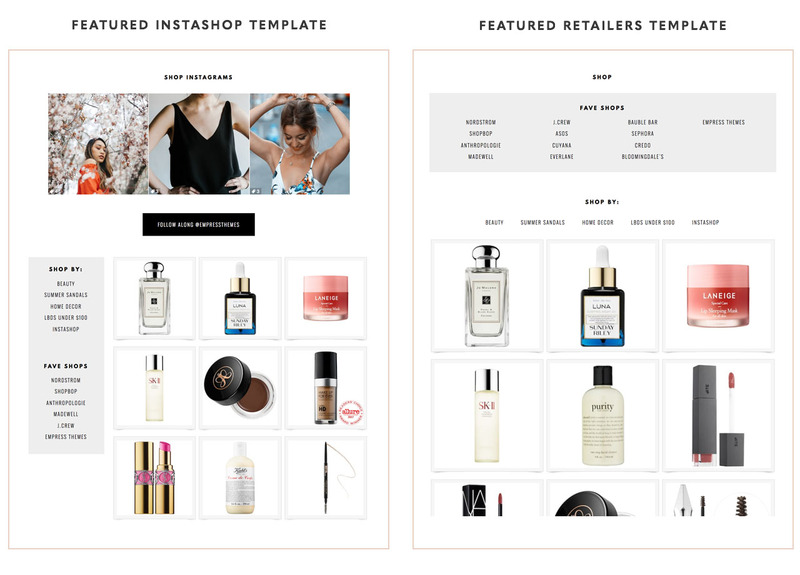 For Archer users, size boutique widgets for the Featured Retailers template at 800px; for the Featured Instashop template, size your boutique widget at 580px. Don’t want to feature a retailer list? Like the layout of the Instashop template, but don’t want to feed in the top part? Any section that you leave empty in your Boutique template simply won’t appear on the Shop page. So feel free to customize your Shop however you’d like! Get creative when naming your boutiques! While general shopping categories like “Beauty,” “Accessories,” “Clothing,” and “Home” will work fine, experience has taught us that the more specific you are with your affiliate widgets, the better. Consider creating boutiques around recent popular content. For example, if you recently featured a home tour and got a lot of questions about your bedroom furniture, you could create a boutique called “Shop my bedroom.” Or, seasonally, you could create boutiques around on-trend products (as an example, in summer, an “Espadrilles under $100” boutique). How large should I size widgets for the Boutiques plugin? My rewardStyle widgets won’t display and are only showing the shortcodes. Why is the Classic Editor plugin required with Boutiques? I don’t see the Boutiques plugin in my Customizer. Where is it?